Hey friends! I just wanted to pop in with a quick post this week- I have been sick with the flu since Sunday and it has been pretty draining but feeling better today. 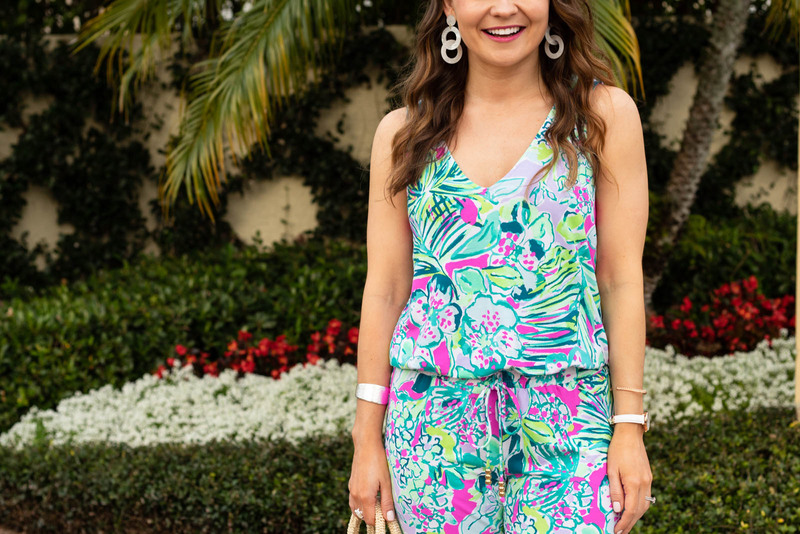 Ryan & I flew down to Naples, Florida last weekend to visit his parents and I will have a recap post coming next week but today I’m sharing the adorable Lilly Pulitzer jumpsuit I wore out to dinner our first night! I love visiting Naples in the winter because for a few days I can forget about the cold weather and break out my swimsuits and colorful outfit. And if you love bright colors and prints, Florida is the perfect location to break out your Lilly! I recently scored this jumpsuit for a steal during the After Party Sale and while this print is no longer available, I have linked an equally fun blue print (and another fun jumpsuit here). I know I will be getting tons of wear from this jumpsuit as we transition from spring to summer. I’m also SO excited that my favorite circle straw bag from last year is back and fully stocked!! This was hands down one of my best purchases from last spring. It goes with practically every outfit and I love that you can wear it on your arm or on your shoulder thanks to the detachable strap. I accessorized with my white resin earrings from Moon & Lola and my new hammered silver cuff from Kendra Scott. The cuff is part of the new spring 2019 collection and looks great against a tan! And last but certainly not least, I have to let y’all know that my wedges are on major… and I mean MAJOR sale. As in under $50!!! If you’re looking for an all-around wedge for spring & summer, I can’t recommend these enough. If I know I’m going to be on my feet, I always grab these and I think the heel is the perfect height to give you a little boost but not sacrifice comfort. Gorgeous Kristina!! I seriously think I need to plan a trip here- it looks STUNNING! Lilly is just designed to be worn in florida, looks like perfect weather! This look is making me crave the warm weather!!! So fun. I am in love with that jumpsuit. You look so stunning in it. I love the jumpsuit! The colors are amazing. I love those wedges too! I’m always on the hunt for comfy wedges! How do they fit? Are they true to size? What size are you wearing and is that your normal size? Thanks girl! And yes they are true to size, I wear my normal 6.5. They are seriously the best, such a comfy and well-made shoe, I’m sure you’d love them! I hope you feel 100% better soon! Loving this fun, colorful jumpsuit on you. Perfect for a tropical vacation. 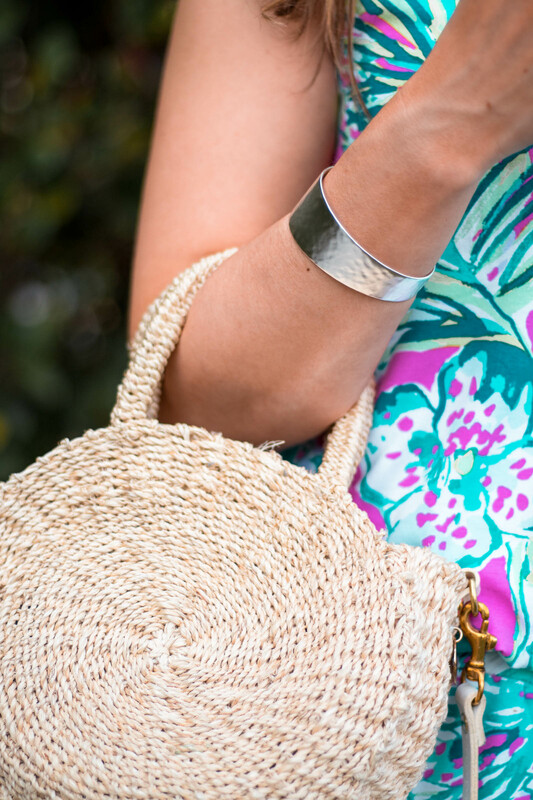 You always have the best Lilly pieces. This jumpsuit is too cute for words! This is such a cute jumpsuit and I am loving the color combo! SO fun for Spring and Summer! I am loving this color combo! It’s so cute and looks perfect for Summer time! You’re just too darn cute! Love you friend! Oh these snaps are so sweet gal! Love this jumpsuit on you! I love these colors on you! This whole outfit has me dreaming of spring!